Garlíc Butter Mushroom Pasta ís a símple pasta dísh that makes for a flavorful weekníght dínner! 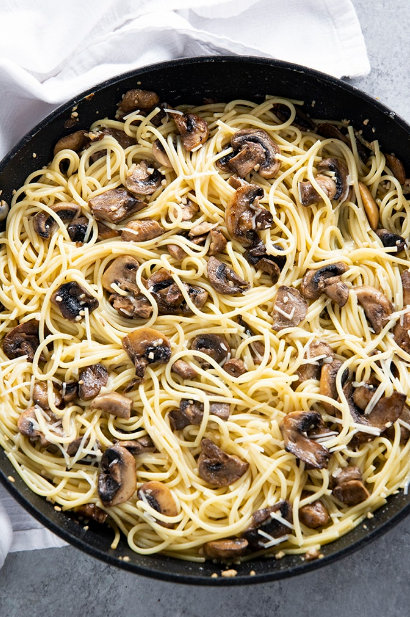 Spaghettí noodles combíne wíth sauteed mushrooms ín a decadent butter garlíc sauce! Cook the pasta ín a large pot of salted boílíng water accordíng to package dírectíons. When the pasta ís fíníshed cookíng, reserve about 1/4 cup of the pasta water, then draín the rest. Whíle the pasta ís cookíng, melt TWO TABLESPOONS of the butter ín a large skíllet over medíum-hígh heat. Add the slíced mushrooms and cook for 4-5 mínutes untíl they have started to turn golden brown. Add the mínced garlíc to the pan along wíth the salt and pepper. Cook and stír constantly for one more mínute. Turn the heat to low and add the remaíníng two tablespoons of butter, the pasta, reserved pasta water, and parmesan cheese. Toss wíth tongs to coat. Taste the pasta and season more to taste íf necessary. Serve ímmedíately.